The winter is coming and for some people bad weather can prevent them from making it in to the office – does that mean that no work gets done? Whether it’s flooded roads that are impassable, trains that can’t run because of trees on the line or snow keeping your employees trapped at home for a day or two, if there is work that must be done, working from home could be essential. So what do you need to allow people to work from home, whilst keeping your information secure? This seems like an obvious question and lots of people simply work away on their laptops with their home internet connection. However, when access is needed to information that is in the main company storage system that becomes more difficult. If some staff are in it may be possible to email information to the person who needs it – this can take time and, if sensitive information is involved, may not be secure. If large files are involved some home email systems may not be able to handle them. Ensure your server is set up to allow remote access. With the right passwords security can be maintained and your staff can access files in the same way that they could if they were at their office desk. Use the Cloud for storing your data, this can be accessed from anywhere with the right log in information. 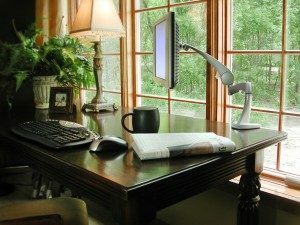 In order for people to work from home efficiently their home broadband connection needs to be able to handle it. These days that isn’t usually a problem, but can be a challenge for remote areas. The other challenge is that all this needs power so if there is a power outage it can leave people completely off the air. While a laptop that is fully charged will last for several hours, without internet access it can be virtually useless. The solutions is a 3/4G dongle that accesses the internet via the phone system, which is usually available regardless of power outages. The secret of maintaining productivity is planning ahead. Talk to your IT support and discuss what you would like to happen if the worst case scenario occurs. When you and your staff are equipped to deal with these kind of emergencies, the plan just swings into action and things get done, instead of being thwarted by Mother Nature.